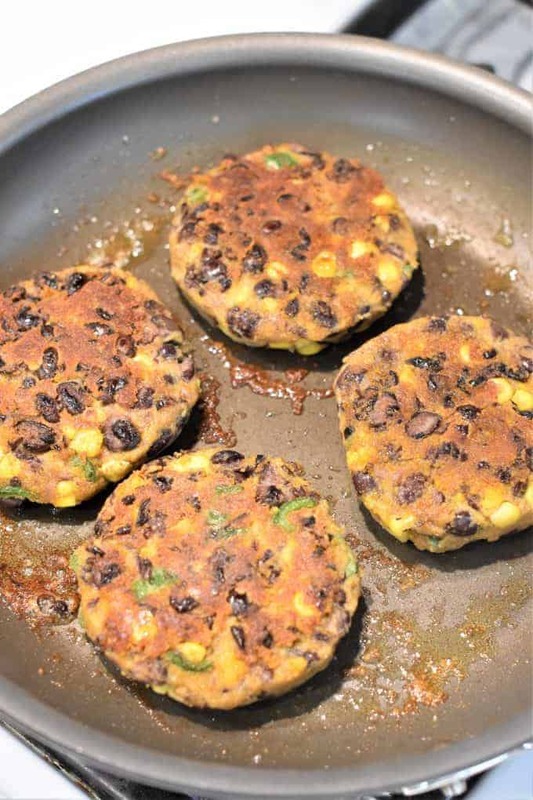 These Sweet Potato Black Bean Burgers feature the sweetness of corn and the spiciness of jalapeno. They are extra delicious topped with our Creamy Avocado-Jalapeno spread and your favorite bun. These burgers are NOT made with chickpeas! I know. I couldn’t even believe it myself. I mean, my world (OK, just my kitchen) revolves around chickpeas. But today, I’m making room for another legume to take center stage…the black bean! But of course, I couldn’t leave my chickpeas hanging. Chickpeas are like the late (may he rest in peace) Stan Lee…they have to have their cameo (in one shape or another). In this recipe, they just so happened to make their appearance in the form of chickpea flour. 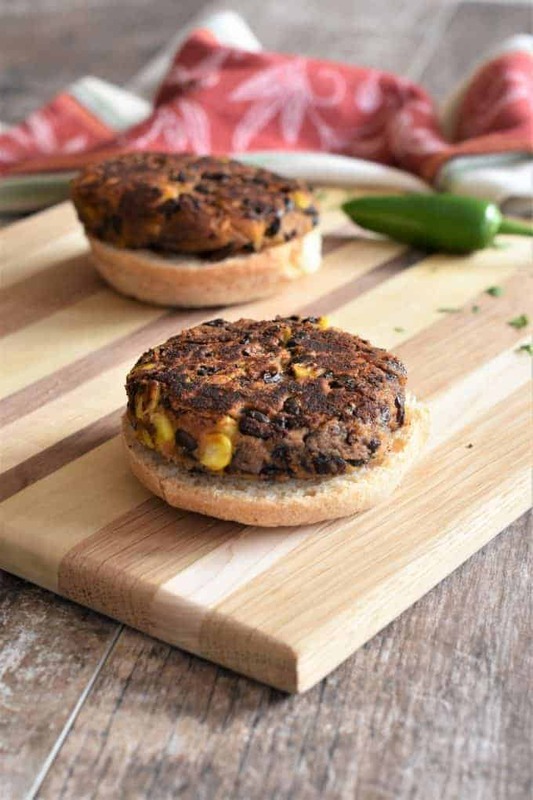 These tasty meatless burgers are packed with healthy ingredients such as sweet potato, black beans, corn, jalapenos and nutritional yeast. They are also easy to make and perfect for any night of the week. This recipe requires pre-cooked sweet potato and frozen corn that has been brought to room temperature. You can bake a sweet potato in the oven or take the quick route and microwave it. Either way, be sure to pierce the skin in multiple places with a fork before you cook it. Wrap in aluminum foil for the oven or a paper towel for the microwave. The oven method takes about 45 minutes on 400°F while the microwave method only takes around 5-8 minutes. Of course, you could also use a leftover baked or microwaved sweet potato from your fridge if you happen to have one. As for the corn, you can defrost it one of three ways. One way is by sealing it in a small resealable plastic bag and submerging in cold water until thawed. Another way is to add to a small strainer and run cold water over it until it is thawed. If you use this method, be sure to drain the corn. Lastly, you can use the defrost feature on your microwave by defrosting in 30-second intervals until the corn has reached room temperature. Before you start the burgers, you can make the Creamy Avocado-Jalapeno spread if you are using it. Start by scooping avocado flesh into a small mixing bowl. Stir to combine chopped jalapeno, chopped cilantro, lime juice, vegan mayonnaise, garlic powder, onion powder and kosher salt to taste. Cover and refrigerate until ready to use. Add cooked sweet potato and 1 cup black beans to a large bowl. With a fork, mash the beans and sweet potato together. Add the remaining black beans, corn, jalapeno, chickpea flour, nutritional yeast, kosher salt, onion powder, garlic powder, white pepper and paprika. Use a spoon to combine ingredients until they are well incorporated. Form into burger patties. Depending on the size, you will get 4 or 5 burgers. I made 4 on the larger side. Heat two tablespoons olive oil to a large skillet over medium heat. When oil is heated, place Sweet Potato Black Bean Burgers in the pan. Cook for 5-7 minutes. Carefully flip each burger and cook on the other side for another 5-7 minutes. Place on your favorite vegan, gluten-free buns (if using) and top with Creamy Avocado-Jalapeno Spread (if using). Use a spoon to scoop avocado flesh into a small mixing bowl. Add chopped jalapeno, chopped cilantro, lime juice, vegan mayonnaise, garlic powder, onion powder and kosher salt to taste. Stir to combine. This recipe requires pre-cooked sweet potato and frozen corn that has been brought to room temperature. You can bake a sweet potato in the oven or take the quick route and microwave it. Either way, be sure to pierce the skin in multiple places with a fork before you cook it. Wrap in aluminum foil for the oven or a paper towel for the microwave. The oven method takes about 45 minutes on 400°F while the microwave method only takes around 5-8 minutes. Of course, you could also use a leftover baked or microwaved sweet potato from your fridge if you happen to have one. As for the corn, you can defrost it one of three ways. One way is by sealing it in a small resealable plastic bag and submerging in cold water until thawed. Another way is to add to a small strainer and run cold water over it until it is thawed. If you use this method, be sure to drain the corn. Lastly, you can use the defrost feature on your microwave by defrosting in 30-second intervals until the corn has reached room temperature. Please note that prep and cook times do not include the pre-cooked sweet potato or room temperature corn. Love this! We try and incorporate lots of plant based dinner and this one looks like one my whole family would love! Great recipe! What a great burger substitute! I have had veggie burgers before but none quite as hearty as this. I bet the jalapeno really adds a kick! I can’t wait to try that creamy avocado spread. What a great idea! And actually frying them in a pan will give that added flavor that makes it truly a burger. I have a friend that I will totally be passing this on to, because she loves black beans in everything! These look so flavorful! Love how they crisp up so nicely! These burgers look so good and easy to prepare I bet this is a perfect weeknight dinner because who doesn’t love a good veggie burger I know I love them!